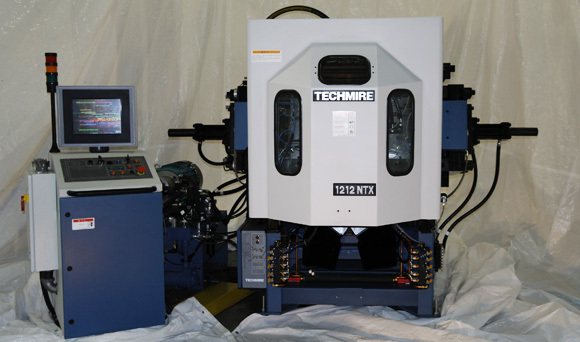 Building on its expertise as the world’s leading producer of high speed, multiple-slide die casting machines, TECHMIRE has introduced the 1212 NTX model, featuring a larger die size of 12’’ x 12’’ (305 x 305 mm) with a greater clamping force of 65 tons, extending its technology to offer the benefit of parting- line injection to a larger shot size. Please, be advised that effective October 20th 2011 our Agent Agreement with IMA (Innovative Machine Applications LLC) for North America will expire and, as a result of a new strategy conceived to better serve our customer in the region, we will deal directly with you from our offices in Montreal. Effective immediately, our North American customers should contact only our customer service department to order spare parts or for assistance in diagnosing machine problems.